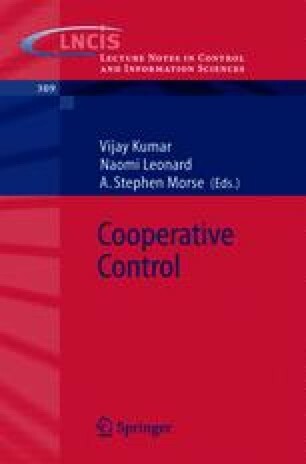 A mathematical model is developed for the study of cooperative control problems for multiple uninhabited autonomous vehicles (UAVs). This model includes a representation for the vehicles, environment, and communication network. Then, we introduce a simple integer programming (IP) approach that allows the UAVs to cooperatively decide where to go, and compare it with a strategy with no cooperation between vehicles. The main contribution here is the model, its representation of the many challenges presented in cooperative control, and the analysis methodology, where there is a focus on verification of closed-loop system properties and identi.cation of principles and design trade-offs.